Bike lovers – we have a reader contribution! this is how it ended up! rechromed and rebuilt original wheels, new 2 pack paint, new decals, everything polished. I think I like riding it more than my wife! 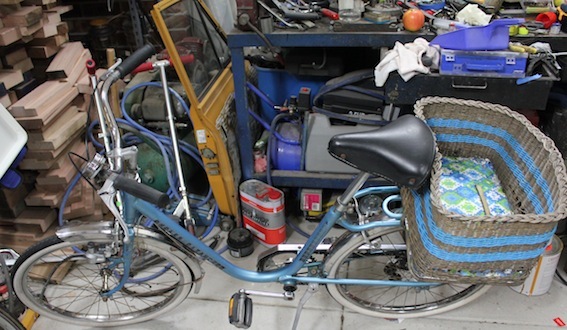 The back story is that she wanted a retro bike like some of her friends had, but I promised her I would do something a bit different, and restore a genuine French retro bike. it is all original, even the lights work. 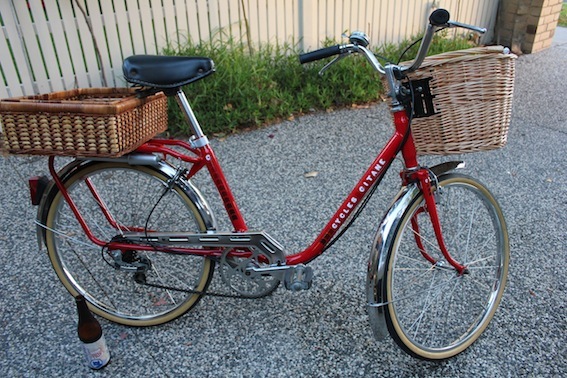 I had a lot of enjoyment restoring it, and it gets heaps of comments! I love looking on this blog, have been lurking for a while, there are some real nice bikes on there. Nice work! 3. did you take a leaf out those make-over shows when you were taking the ‘before’ shot? Not really showing it in its best light crammed into the workshop, unflattering angle etc. 5. hooray for Stuart, you have restored my faith that we little bike folk like to see what each other are up to. Thanks Lisa! What are you restoring? I found a little Malvern Star at the dump. She is all sprayed up in a fabulous shade of red now I just have to put it all back together again. Oh yay, Lisa I was wondering how your Malvern Star was going. Don’t forget to send me before and after.